In 1818 James and Susan Angevine left their comfortable home in New York City for the life of a pioneer family in the new state of Indiana. Attracted by the plentiful supply of water, the family build its first log house on the bank of the creek only to see it wash away in the spring "freshnet" (spring thaw) that was so common to the area. Angevine Cabin, Lawrenceburg, Indiana. Photo by DCHS 2017. Angevine cabin, interior. Lawrenceburg, Indiana, DCHS 2017. Fireplace in the Angevine Cabin, Lawrenceburg, Indiana. Photo by DCHS, 2017. Determined to be safer in the future, they promptly built this structure high on a hill. They were to occupy it for the next ten years. James and Susan eventually had 12 children, most of whom lived in this house, which was actually quite large and comfortable for its day. Many cabins of the early residents did not boast of wooden floors but were simply built on the bare soil. Heat, and to some extent, light, were provided by the big fireplace, a convenience in winter but certainly adding to the discomfort of sultry summer weather. Cooking was done over the fire, mainly in big iron pots that could be hung over the flames. Dutch ovens fitted with rimmed kids to hold live coals, could be used for baking. Life for the early pioneers meant hard work for adults and children alike. Water had to be hauled either from the creek or from a well. Wool and flax had to be prepared and spun into thread, and then woven into cloth, after which it was hand sewn into clothing. Wood had to be cut split, and brought into the house on a daily basis. Fields had to be cleared and even children were expected to work in the corn and wheat crops, sometimes planted around the stumps of recently removed trees. In 1830, the Angevine's built a large brick house which still stands on Hartman Road, and which is still being used as a home. The log cabin became rental property, with additions and changes over the years, and eventually fell into disrepair. Angevine Cabin, Lawrenceburg, Indiana. Photo DCHS, 2017. Glass windows in Angevine Cabin, Lawrenceburg, Indiana. Photo by DCHS, 2017. Loom in Angevine Cabin, Lawrenceburg, Indiana. Photo DCHS, 2017. Shutters on the Angevine Cabin, Lawrenceburg, Indiana. Photo by DCHS, 2017. Furnishings in the Angevine Cabin, Lawrenceburg, Indiana. Photo by DCHS, 2017. 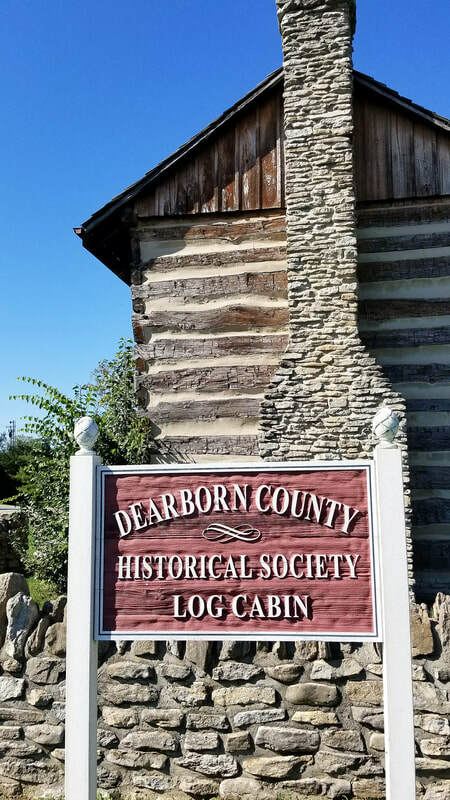 In 1985, the newly formed Dearborn County Historical Society was offered the old cabin by the Kammer family. The ground was broken to move the cabin on July 30, 1988. Thanks to the help from many generous donors, including descendants of the original Angevine family, we were able to carefully take the old building apart, log by log and reassemble in on land leased to us by the City of Lawrenceburg. It has been furnished with items that would have been found in a similar cabin. The Bed was made by the Brown Furniture Company in Lawrenceburg. It is a rope bed, that is, support for the mattress is provided by tightly wound ropes that criss cross the frame. The mattress itself would have been stuffed with feathers or even corn husks. The Angevine Cabin is open for tours by appointment only and during many special events throughout the year. The video below was filmed during Pioneer Weekend, October 2017. DCHS Board member Jim Hammil is the speaker describing the cabin. Historical marker for the Angevine Cabin, Lawrenceburg, Indiana. Photo by DCHS, 2017.